Calling all ladies looking for a night out with a creative twist! Mark your calendars for Thursday, March 23 from 6:30 to 8:30 pm for a Pottery on the Wheel Class ladies night out! Lake Country Fine Arts School and Gallery in downtown Hartland is going to host the first 24 ladies that register below to do a fun pottery class. Check out the details below! What is Lake Country Fine Arts School and Gallery? Lake Country Fine Arts, founded in August of 2000, is a nurturing, creating environment for people of all ages and abilities. Owner Marlene Millevolte has been teaching pottery and clay sculpting since 1992. She finds joy in encouraging people to find their creative passion. Many times it isn’t about the finished product, but it is often about the experiences and memories formed while creating. Creating art in any medium is healing and therapeutic. Lake Country Fine Arts is a safe, positive studio for creative energy to grow and be shared. Millevolte said “As a child, I learned to bake. I sculpted the bread dough before shaping the loaves and the cookie dough before making the cookies on the pan. When I had clay in my hands for the first time, it filled my soul and it still does to this day.” Millevolte challenges all people to allow themselves the much needed time to create, using whatever avenue and medium at hand. Lake Country Fine Arts School is located in downtown Hartland. 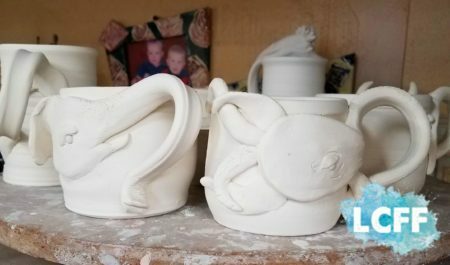 They offer wheel throwing classes, handbuilding and sculpting with clay classes, glass fusing classes, pottery classes, and adaptive art classes (clay and drawing). In addition to classes, they also offer parties for children and adults. Please see their website for more information. Everyone is welcome, even those (like me) who have never used a pottery wheel before. Marlene is experienced in working with beginners. She will give our class a brief instructional introduction, and then let eight ladies start their pottery bowls. We will continue to work in groups of eight until all 24 ladies have had a chance to make their pot. Marlene can be as hands on or hands off as we would like her to be, depending on individual skill level. There will be light refreshments available as well. After all the ladies make their pots, Marlene will glaze them. Attendees will then pick up their glazed pot after the event. Aprons will be handed out and worn during the wheel process, but casual clothes that you don’t mind getting a bit dirty are recommended. Should you get some clay on your clothes, no worries. It should wash out when you launder your clothes. Flat closed shoes are also necessary. No spikes or flip flops please. This class is regularly priced $35. 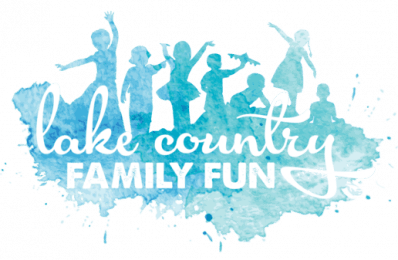 However, Lake Country Fine Arts and Gallery is giving all of the ladies that register through Lake Country Family Fun $10 off! A fun night out for only $25? What a deal!! Please pay the night of the event, directly to Lake Country Fine Arts and Gallery. They accept cash, check, and credit cards. So grab your girlfriend, your creative side, and sign up below! Please fill out the form below. Registration is required to appropriately plan for the evening. Registration is limited to the first 24 ladies that register. Emails will only be used to remind registered attendees of the event.